I know I said I wouldn’t post anything this week, due to our move. But it’s Saturday and cold and I made something nice this morning, so I thought I’d share. 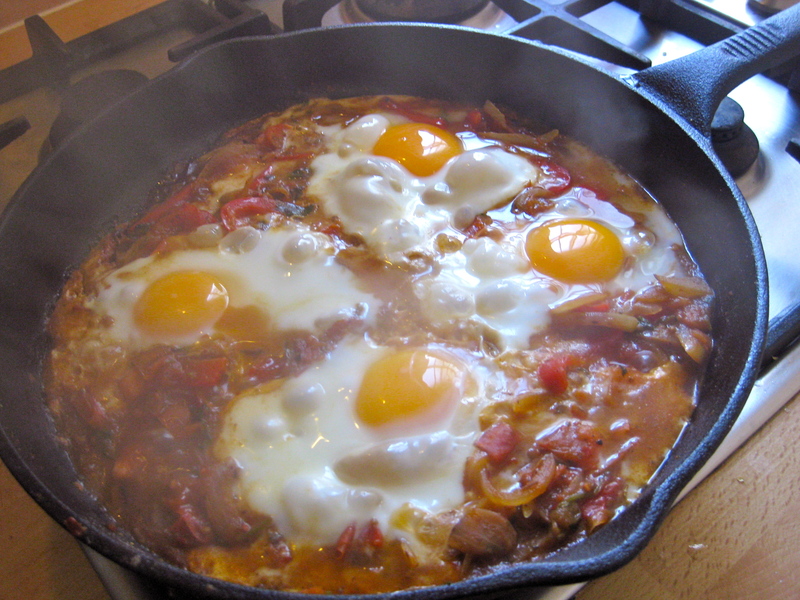 Shashuka is a north African dish which I think we’ve seen all over the place in the last few years. This recipe is from Ottolenghi’s Plenty book. I didn’t have a lot of the ingredients, but I still made it with what I had and it turned out great. I like this because you could make up a batch of the tomato sauce on the weekend, put it in the fridge and then it can become a quick and easy breakfast during the week. You can add beans, spinach or chorizo and turn it into dinner. This dish is fresh and tasty and perfect for when you’re feeling like a savoury start to the day. Saute the onions and cumin in some olive oil. Add the peppers, sugar, herbs. Add tomatoes, cayenne and season to taste. Cook off, over a medium high heat, adding water so it doesn’t dry out. About 5 minutes. Make little holes in the mixture and drop the eggs in carefully. Cover if possible and cook eggs till done. Don’t over cook or you won’t get all that lovely runny yoke to mix into the meal. Serve with bread. (or not).